Figure A14. Beaufort anomaly, interpreted as the Beaufort slab, with (horizontal) [vertical] cross sections through (A)[D] the UUP07 p-wave) and (B)[D] the combined SL2013 and S40RTS s-wave models at 2570 km; C) the location of the modern geological record that we interpret to have formed during the subduction of the slab. 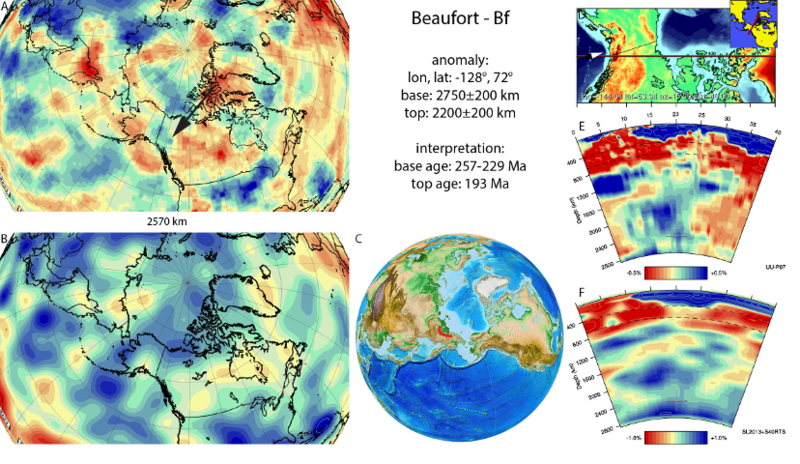 The Beaufort anomaly (Figure A14) is located below North Alaska and the Beaufort Sea within the deep mantle. It was first identified in van der Meer et al. (2010) and subsequently Shephard et al. (2014) interpreted its dynamic evolution based on modelling. The base of the Mongol-Kazakh slab, as well as the base of the Idaho slab (section 3.42) to the south at similar depth, led us to interpret the anomaly as the Beaufort slab representing lithosphere that likely subducted during the Early or Middle Mesozoic in the Arctic. Nokleberg et al. (2000) reconstructed subduction of Arctic/Panthalassa lithosphere at the Alazeya arc and forming the Aluchin subduction zone terrane, during the Late Triassic-Jurassic, and was chosen by van der Meer et al. (2010) as most likely correlation for this slab, with the time of subduction of 230-144 Ma. Shephard et al. (2014) preferred a tectonic model suggested that the source of the Alazeya arc was subducting Panthalassa lithosphere between 230-193 Ma, followed by a subduction polarity reversal in the reconstruction of Nokleberg et al. (2000). A more recent geological and geochronological study of Sokolov et al. (2009) described the Alazeya arc and several of its terranes (Yarakvaam, Vurguveem, and Aluchin ophiolites) in more detail and found ages of amphibolites associated with ophiolites (239.1±8 Ma) or in tectonic blocks in sub-ophiolitic melanges (229–257 Ma). Sokolov et al. (2009) interpreted this to reflect the age range of the entire subduction history below the Aluchin ophiolite. Amphibolites associated with ophiolites are, however, frequently related to the early stages of subduction (metamorphic soles), after which temperatures in the subduction zones decrease and blueschists are formed instead. Sokolov et al. (2009) does not describe the structural context of these amphibolites within the ophiolite structure in detail, but we conservatively estimate the 257-229 Ma age range to reflect the age of the base of the Beaufort slab, reasonably in line with the estimates of Nokleberg et al. (2000), and adopt the 193 Ma age preferred by Shephard et al. (2014) as the end of subduction.